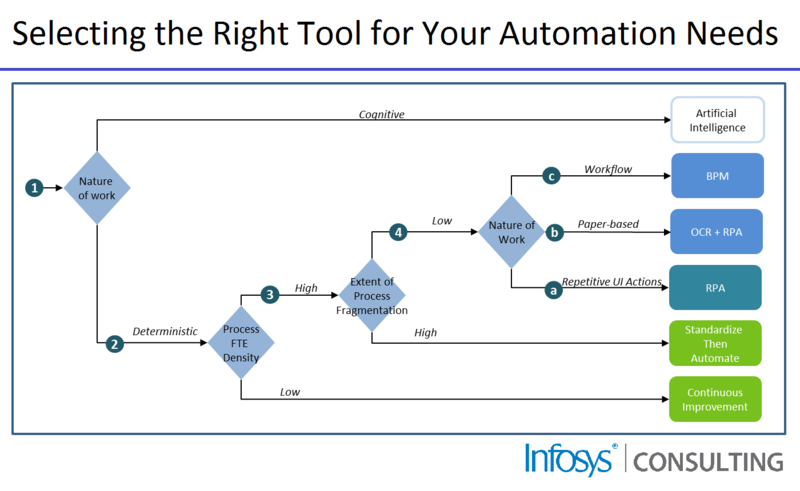 Picking the Right Automation Tool for Your Job - Infosys Consulting - One hub. Many perspectives. Never has the old saw “To a consultant with a hammer, everything looks like a nail” been more appropriate than it is with today’s automation market. Robotic Process Automation and Artificial Intelligence are trends that are clearly approaching peak hype cycle. Software vendors, analysts, consultants and the technology media have embraced the hyperbole with overblown promises of extraordinary savings. To assist IT decision makers in selecting the right technology for the problem, we have prepared a handy automation decision tree. The first question to address is whether the nature of work is Deterministic or Cognitive. Low value-added, manual, repetitive tasks fall in the deterministic category, while cognitive tasks revolve around machines being able to identify patterns and prompt users or resolve issues proactively. 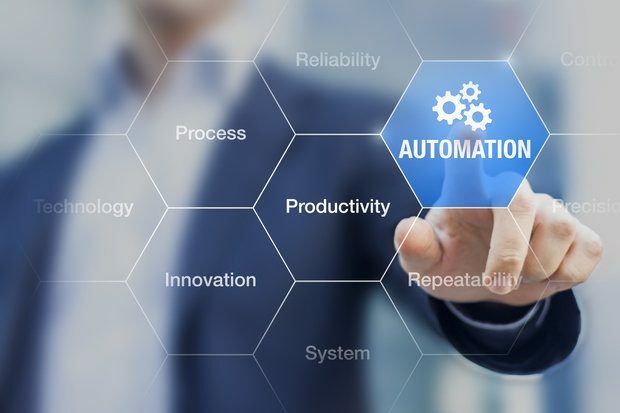 While deterministic tasks can be found anywhere within an enterprise, high-volume deterministic tasks tend to be concentrated in shared service centers, making them ideal candidates for RPA, BPM and Standardization and Continuous Improvement Initiatives. Cognitive tasks that require advanced problem-solving and leverage large data sets are a good place to look for opportunities to leverage Artificial Intelligence. What is the FTE Density of the process under consideration? In order to right-size your investment to the savings potential, the next question to get a handle on is: “How many FTE (full time equivalents) are performing a given task?”. Process areas with a low density of FTEs are unlikely to be able to sustain the savings required to support a BPM or RPA investment, particularly if these resources are already located in a low-cost location. Low FTE density processes should be addressed with lean six-sigma techniques or basic scripting technologies. What is the fragmentation of the process? One of the quickest ways to erode the business case for RPA is to have highly-fragmented processes. Processes can typically be fragmented by system, by customer segment, by line of business, by channel or by geography. A highly-fragmented process can significantly increase the cost of automation. It is advisable to focus first on standardizing the global process to make future automation easier. What is the nature of deterministic tasks? While each automation opportunity needs to be evaluated independently, this handy guide can assist in quickly identifying the right tool for the job and avoiding the costly mistake of trying to use a hammer when a socket wrench is required. This is the second post in our series on Automation. Joshua Biggins is a partner with Infosys Consulting where he leads the Enterprise Strategy & Architecture practice for a number of industry verticals. 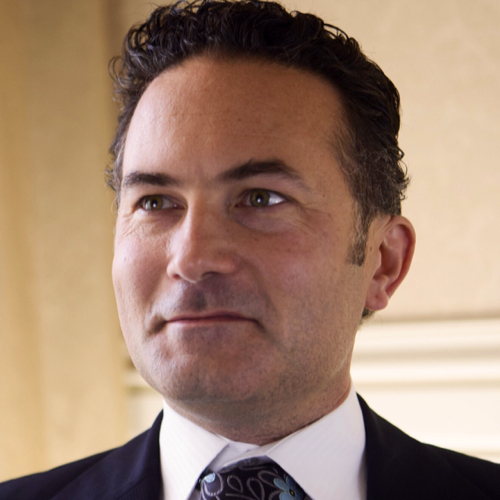 For the last 22 years he has focused on helping clients leverage technology to transform business models and unlock value. His experience is focused on the most pressing issues on the CIO agenda, including AI and automation, IT cost reduction, application portfolio rationalization, managed services transformation and technology modernization. Kaushik Rana is a Senior Principal with Infosys Consulting where he focuses on helping clients unlock the value inherent in a variety of automation technologies. 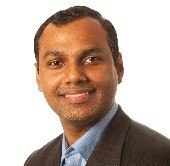 He has led large strategic initiatives for Fortune 500 clients and accelerated their transformation journey leveraging automation technologies like robotic process automation, business process management suite combined with his deep expertise in process excellence, cross-functional team leadership and systems knowledge.